Occasionally I’m inspired to try something new. To be honest I am a born creature of habit especially, it seems, when it came to my cooking. However, about six months ago I found this great blog. At the time I was completely unaware of how popular it was but let me tell you, it’s big. So big that a few months ago said bloggers kitchen line was released in Wal-Mart. I started making a few recipes and before I knew it I was hooked! So today with my new, but one of many, cookbook in hand I set out to use up excess spinach we had in our fridge. We have been eating salad, tacos and two different pasta dishes that require it but it wasn’t enough. Thus enter my trusted kitchen companion, The Pioneer Woman. 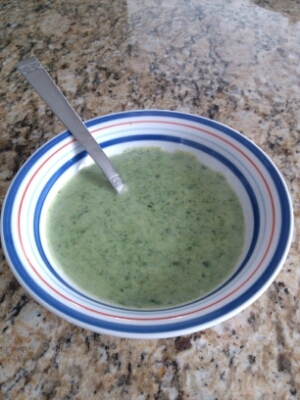 Spinach soup (you can find the amazing recipe by clicking here ). I have to say I was sceptical. Spinach for me has been a flavor I’m grown into over time so this was a LOT of spinach. As in main ingredient not the side. Well, let me tell you AMAZING. Its the only word strong enough to describe it. Not only was I able to use up the spinach in a tasty way, but I have lunch for tomorrow as well. An added bonus for us is the high iron. Tag Along, tends to need added iron in his diet or supplements. I’m looking forward to my next new recipe by Red Drummond. I wasn’t a bad cook before but her recipes have made my husband think I’m great. What a plus for a marriage. Ironic, maybe the way to a man’s heart is through his stomach. Happy homesteading everyone and thank you Ree!